I've been meaning to make numerals for my address for a while. I still have the crappy hardware store numbers that came with the house when I bought it. There is no excuse for this, since this is such a quick and easy project! Finally, I am getting a round tuit, a thing I have been needing for a while. Here's my slab, all rolled out. I like a rolling pin for this; I find it compresses better than either a slab roller or the toss & stretch method. (I am going to type variations on the word "compress" a tedious number of times, but it can't be said often enough: if you are making flat things, compression is key to avoid warping and cracking.) I roll on both sides, flipping often, in several different directions, because why? Congregation calls back: "COMPRESSION!" I especially like those big, heavy, solid maple rolling pins, but that is partly aesthetic. I love a good tool. But I digress. Once the slab is rolled to about 3/16ths of an inch, it's time for more compression! A flexible metal rib is best at this wet stage. Both sides, several directions. I used food coloring to paint out the numerals. Just for the pretty, I decided to texture my numbers with this roller I got from MKM tools. I make most of my own rollers, out of clay, but MKM has some nice ones. They are also just lovely little objects, so sometimes I can't resist. Again, beautiful tools make me happy. I place another bat on top of the slab while it is drying to a leather hard stage. My studio is quite cool overnight - low 50s - so it isn't necessary to cover it with plastic, but if yours is a more usual indoor temperature, you probably should drop a sheet of plastic loosely over top. The weight of the second bat, and the absorbency - do not use plastic bats for this! - will help prevent warping. If I need to turn the slab over, I do so by holding both bats like a sandwich and flipping the slab between the bats. Once the slab is early leatherhard, it's time to - you guessed it! - compress some more. Flip (using the bat-sandwich method) and compress the smooth side. A very bendy rubber rib is best at this point. I like those red gummy ones, I forget the manufacturer - Mudtools, maybe? It's time to flip the bat sandwich again, then remove the top bat and cut the numbers. 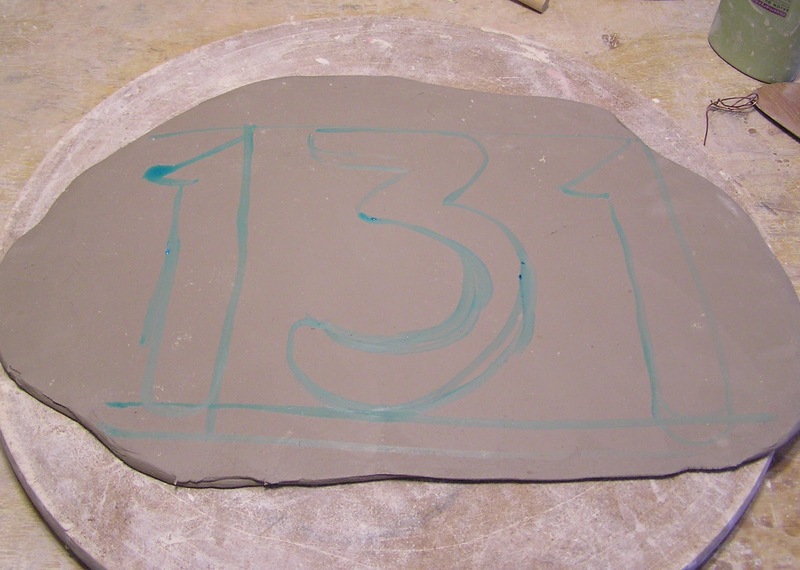 Remove the slab from around the numerals, not the other way around. The edges will need extra attention - I run a fingertip over them to smooth and compress. Now: STEP AWAY FROM THE CLAY. These will want to dry slowly with plastic loosely over top. Once they are firm enough that I can move them without bending them, but not yet brittle (a fairly narrow window, with thin items) I will want to make holes in them for the screws. I know, I know - thanks, Captain Obvious! - but I have been known to forget this step. I slide the numeral to the edge of the bat, so I can drill the hole while still allowing most of the piece to be supported. A drill bit makes the tidiest hole, but a fettling knife will work in a pinch. Now there's nothing left but the drying: again, slowly, lightly covered. On drywall, if possible; if not, a sheet of newspaper helps to wick away moisture from the underside, so the top doesn't dry faster and cause curling or warping. Now that these are in progress, I can't wait to replace the ugly old ones. It's a mystery to me why I waited so long to do this! I am known as something of a holiday curmudgeon. This is not an entirely unfair characterization: New Year's Eve is Everyone is Having Fun Except You Night; Valentine's is Prove You Love Me Day. Independence Day is loud, and the people who most need a day off usually have to work Labor Day. Thanksgiving is okay as long as there are no TVs nearby - parades and football bore the arse right off me. See what I mean? Curmudgeon, right? So when I choose to be alone on Christmas Day, the assumption is more curmudgeonry. (I just made up that word. Do you like it?) Though it's true I don't like to participate in the cultural frenzy associated with Christmas, my solitude is not sulking. I take advantage of the day the world stops as a moment of quiet contemplation. My contemplation may take a different form than most; work is my meditation. I do projects, ones I have been wanting to do at least all year. This year I have three in mind, though obviously will not get these all done in one day. Or even week. One is small, one is big, one is...only bigger, because it is more daunting. Small: Ceramic numbers, for my house. This is easy, it just takes getting around to it. Bigger: Refinish my front hall stairs. This is a ton of work but nothing new to learn: I already know how to scrape and sand and paint. 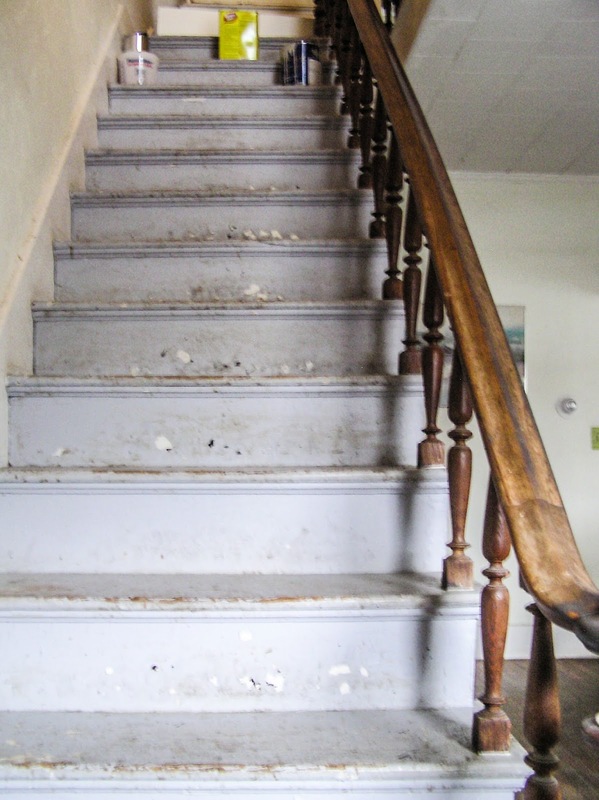 Every day for more than ten years I have looked at theses stairs wishing they looked better but despite my finest efforts of waiting them out and looking at staircases on Pinterest, they have refused to refinish themselves. Biggest: A mosaic for my entry hall. This is not a thing I have ever done before, although I have some ideas on how to approach it. The design I can handle; the ceramics are old hat; but the installation - that's where I will be challenged. Though all appears cold and dead, the real business of winter is renewal. It's time to be getting on with it. 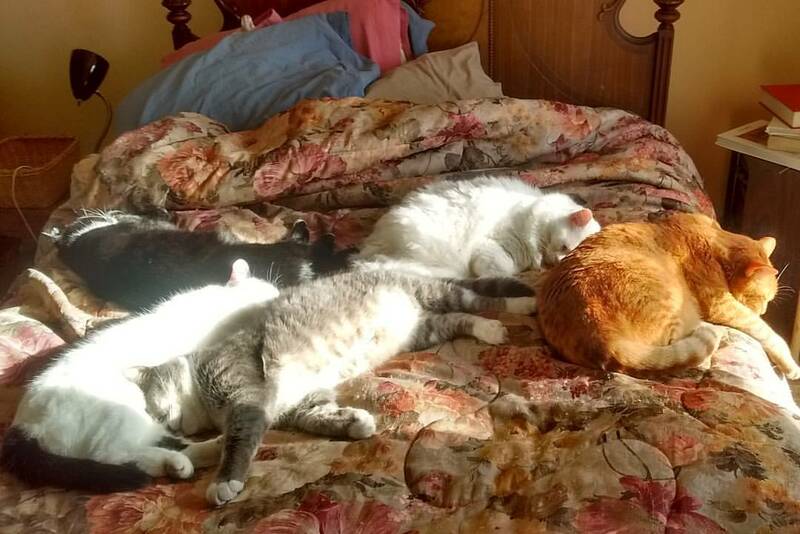 Happy Holidays from the House of Many Cats. Happy Monday! It's going to be a busy day here at Fine Mess Pottery. I have an order due in January (bless them!) and a few other projects I've been meaning to get to. Though I still have gift shopping to do, the busiest part of December is done for me, so I start looking toward 2017. 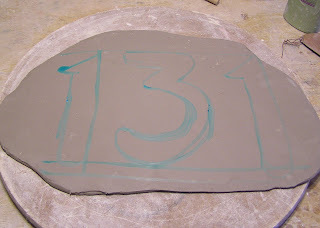 Roll out slab - making street numbers for my house! Call INFAB Refractories - do they have superduty firebrick I can pick up tomorrow? - I may never be this clean again until next year's party. The show is mostly pottery, but lots of other great items too. I got these marvelous hand puppets for my little nephews They were an amazing bargain at only $20 - look how much work went into them. The show & sale is still up thru Sunday. 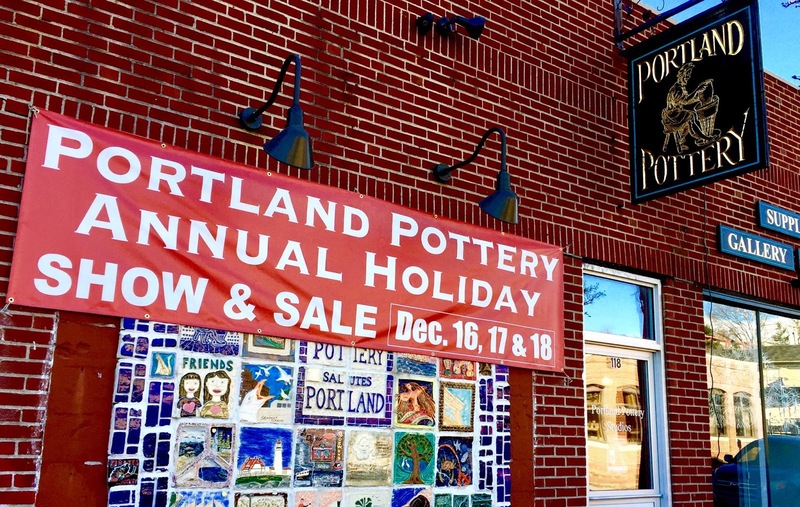 If you are in Portland, you should check it out! It seems the Fire Monkey* had one more shine for me this year: my firing was truly BAD. Much of the kiln did not reach temperature - the cones fell but they were apparently in isolated hot spots. 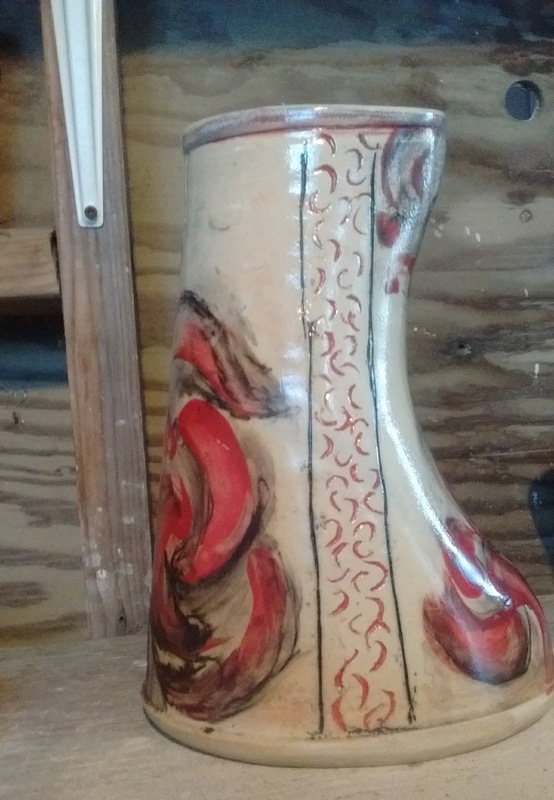 There were a few pots in the isolated hot spots as well, including this vase. 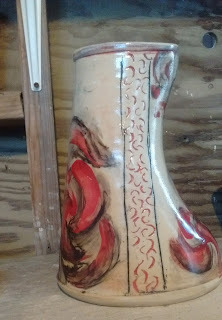 It's an ill wind indeed that doesn't blow some good, and the pots that came out well were mostly the more labor intensive ones, and the ones that came out poorly can mostly be refired. It does mean that I won't have pots for the Portland Pottery show, although I will still be bartending, dressed to the nines, as is my tradition. 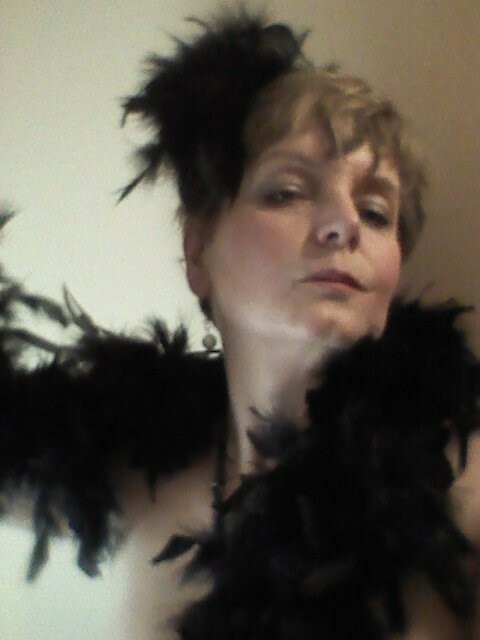 I don't have many opportunities to break out the boa, and I refuse to miss one. I'm bummed, of course, but also philosophical: bad firings happen. (Not usually this bad but hey. Some firing has to be the worst firing. Although come to think of it this was nothing close to the worst firing I've ever had.) You'd think this would be an opportunity for one of my famous, epic, pity parties, but no; I find myself laughing: what else can go wrong? As long as it's not illness or injury, I'm grateful. In other news, I resolved my camera dilemma by kicking the can down the road. When I went to purchase a new one (I was looking at one of these) I discovered that it does not have an infared remote. I thought that would be standard on mid-range & up cameras but I was wrong-wrong-wrong. What I ended up doing was just buying a camera exactly like the 12 year old one I had that died - an Olympus c-750 ultrazoom - which I know is adequate for website work although not for application photos. Upside: it was only $20 on Ebay, being an elderly version at this point. I was looking forward to the wifi feature - upload without cables, etc. - but that's for next time. Anyhoo: since I don't have to set up a display table, maybe I have time to get my hair highlighted. The way my luck is running it'll probably turn green, but if so I'll put a red bow on it and call it holiday cheer! *I speak metaphorically, of course: I am well aware that this is my own fault! Bad Lori! Bad! This is why we do not put things off until the last minute. Labels: Events, Firing, Not Another Learning Experience! is at ^6 right now - yes, at 8 am. 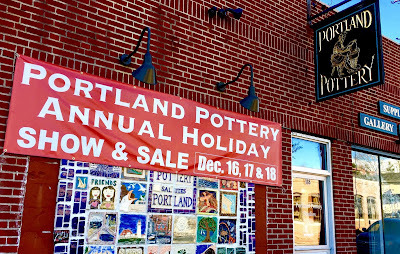 Last minute Lori strikes again: I have one last sale this year - the Portland Pottery Holiday Sale, opening Thursday night thru Sunday. In some ways that sale marks the end of the year for me, and I can't say I am sorry to see this one go. I wrote in February that the Fire Monkey can be irascible and unpredictable, and indeed, it was. Is, still, for a few more weeks. The loss, too young, of Bowie and Prince, require no more response than sorrow, but the Fire Monkey's more recent antics have repercussions for us all. For example: I had planned for the first time ever to replace my car before it died out from under me. I was thinking a (used, obviously) little truck, maybe a Colorado or a Tacoma. Something I could use for art fairs.The economy's humming along, I thought; orders & class enrollments are good. I had reason to believe they would continue. Then the Fire Monkey flung his flaming poo, and that all changed. Now the Magic 8 Ball says recession is likely in the next couple of years, and I do not want to be caught with a car note when it happens. I also need to be saving hard, because it is more than likely I will lose my health insurance, not next year but the one following. I haven't stayed afloat this long by ignoring my Magic 8 Ball. In some ways what happens in Washington is like the weather: sometimes it rains, sometimes it doesn't, not a lot you can do about it. Sometimes you have health insurance for a few years, sometimes someone comes along saying, "Haha, hope you didn't get used to it, sucker!" We vote, we call our legislators, but ultimately we roll with whatever happens, because what other choice do we have? Still, I find a slim silver lining: if I am not buying a little truck, that frees up some of the money I had meant for a down payment to buy a couple of other things I have been needing for a while: a laptop & a new camera. My old laptop - which was old when I bought it in 2011 - was finally so slow that I could hardly bear to use it, which accounts in part for my sharp decline in blogging. I bought a new one last week. I am also getting a camera - my good one shuffled off this mortal coil over the summer, and I've been relying on my cell phone, which is obviously not adequate for my needs. I am leaning towards a Nikon Coolpix b500. My ^8 is falling: time to apply the soda! Trying something different this time. I'll be hurrying the unload a bit, but if there is time before the show I'll post some pix. I've been noticing ceramic supply house selling "kiln wash" like it's some mystery material, like the secret sauce on Big Macs. by weight. Or actually by volume will work, too - it's not that fussy. 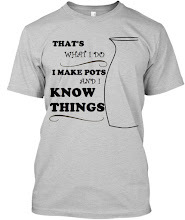 For the professional potters among my readers - I know you already know this. I also have readers who are students or beginners, and I hate to see them wasting money on something so simple. If it's just you, mix it about the thickness of milk; if you are in a teaching studio, mix it more like heavy cream - students have a lot of glazing mishaps. Mix it yourself, and save your money for wonderful things like new ribs, or whoopie pies, or Bailey's Irish Cream, or whatever it is that makes you happy.